Day 365 has come again. New Year’s Eve. Even though it’s just another mark on the calendar, today holds a lot of importance in many people’s lives. And a lot of emotions. At the end of the year comes a chance for many people to reflect on their own year, and the chance to look forward to or predict the next year. As someone who has felt both positive and negative New Year’s attitudes in the past, I’ve recently learned that there is no sense in putting any pressure on New Year’s when it comes to expecting your life to drastically change. To be honest, you never know what the next week, day or hour will bring you. Let alone the next year. And you should not disregard an entire year that was not great to you in desperation that the next year will be better. I have to admit that I am guilty of this. Maybe not so much this year, but there have been New Year’s Eves where I just could not wait for the year to end because there was so much negativity that I will forever associate with that particular year. I just needed a little hope that the bad was behind me and the next year would be an improvement. The problem with this New Year’s mentality is that each year in our lives, good and bad, makes us who we are. Our experiences from year to year are what shape our following year’s actions. You are your experiences, and you should not hold such negative attitudes toward an entire year because who you are on December 31st is a culmination of every moment of that year (and years before, of course). Although there are many things we don’t have control over, you do have control over your thoughts and actions. I believe that any single day you have the freedom to change those thoughts and actions if you want to actually change your life. At the same time, however, there is a certain spirit about New Year’s that gets you excited and motivated to take the actions in improving your life. We all can improve each day–we all want to make minor changes and resolutions and the New Year’s holiday just gives us the extra push. So I say, whatever resolution you have–big or small, life-changing or not–use tonight as your opportunity. I refuse to be silenced from sharing my beliefs and values for fear of being shamed or condescendingly put down. I have been raised to accept people who hold a different perspective than I, and to listen respectfully to their opinions. With this in mind, I don’t take ignorance lightly. I am no better than anyone I encounter who shares a different opinion. But remember that you too are no better for yours. I have the utmost respect for people who have enough confidence to express themselves and their beliefs (particularly when they may be unpopular beliefs) because I know for a fact I don’t always have the ability to stand up and share mine when there is the fear of being judged. We live in a country where you can and should have diverse sets of beliefs, but shouldn’t have that fear of being categorized or generalized into certain stereotypes. Maybe it’s an idealistic concept, but I just wish everyone could feel the same respect when sharing their values as I hope I give people when listening to their opinions. And end rant.. for now. It’s funny what social media can do for you. Thanks to new applications like TimeHop, we can be transported back in time to see and read exactly what we shared with the world in years past. It’s amazing. You can be brought back to an exact day and relive the same emotions. All from one status update. Although I have reminders everyday, TimeHop showed me again today how 2013 was by far the worst year of my life. I say this because I can only pray that I, nor anyone else, ever go through a year like this again. It was the year I graduated from high school with my best friends and the time when I concluded what I now know was a near-perfect childhood in my small town. Following graduation, I had the chance to move to one of the most beautiful cities in the country—Boston. In between those big milestones though, my life was changed. And not just the “growing up” and “moving out” kind of change, but in the way that could make a positive person who was ready to go out into the big world into a slightly more cynical person. A girl who then had to work hard to believe she was perfectly happy moving to a different state during an extremely difficult time, but just couldn’t make it work any longer. This reminds me of the first post I ever wrote for my blog. It was the piece sharing my news of my decision to transfer to Ithaca College. I shared how I truly believed (and still believe) that transferring was not due to “failing” at BU, but due to the fact that I had to make a choice for myself. One that was far from easy, but necessary for my personal health and happiness. The point of this side tangent is that I could go through life focusing on the struggles, but there isn’t one person in this world who is not hurting—who is not dealing with some sort of hardship. There is no comparison between peoples’ hurt. You cannot compare your struggles to a person next to you because you have NO IDEA what that person may be going through. And that’s when perspective becomes everything in this life. We have the choice to change our lives. It’s not going to be easy, and yes it may be easier for different people. However, life can make you so harsh, so bitter. It’s up to YOU to decide if you want to stay bitter forever. Everyone I know who has dealt with hardships understands how there are good and bad days. Depending on the circumstances, there may only be a few good days, but just attempting to make those good days outnumber the bad days is the first step in turning your perspective on life right around. My first step was deciding to transfer schools. It hasn’t been easy in any way; however, I am learning to transform any negative aspect of this experience into a positive. Adjusting is difficult. Adjusting to any change is difficult. But this change is that first step—the first step in making the good days outweigh the bad. Returning to the actual point of this rambling post–life is damn difficult. It throws us curveballs every single day. And sometimes these hardships cannot be reversed, we cannot take the pain away, but we can make sure we continue living our lives in the most positive way that is possible. I want people to know I am speaking from my own experiences and circumstances. I am not ignorant to the heartbreaking pain I witness other people, including my own loved ones go through every single day. 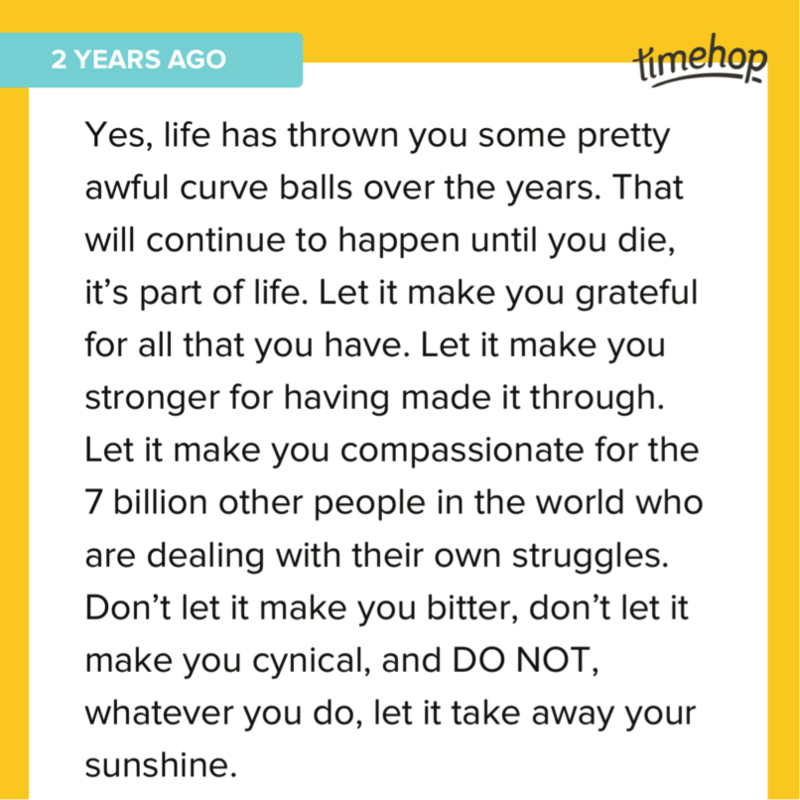 I can sit here and preach about how we can’t be cynical and we have to keep living. However, I do understand how it is not a quick fix, and cannot be the case for every person. You can’t just snap yourself into forgetting about pain, but you can take a small first step. With this understanding, I still do believe there is always beauty in this world (as cliché as this sounds). Even if it’s beautiful memories that we live for, this is still beauty. And I do believe that in our daily lives we cannot let the small things get to us and cannot continue to carry the weight of pain with us at every single moment. Just look for the good. Know that tomorrow is going to be a better day, but without wishing today away. I am far too guilty of wishing my life away–for always looking ahead for the weekend, for the next vacation or holiday, and creating expectations for myself without even appreciating the present. Not living in the present is something that does limit our happiness. I’m not going to be bitter, no matter what I am dealt in this life. I’m going to try and share a little positivity to every person I come into contact with no matter how hard life may feel that day. I’m going to put a smile on my face when I walk out the door each morning and I’m NOT going to let anything take away my own sunshine. Because It’s Not Just Coffee. In case you haven’t been on any social media today, let me give you a very late heads up: today, September 29th is National Coffee Day–a day dedicated to a beverage that holds far too much importance in far too many people’s lives. And as you can probably tell by the title of my blog, I am no exception. I couldn’t tell you when I first became obsessed with this perfect beverage, but I can tell you that without it, I would not be the person I am today–stressed, busy, sleep-deprived and yet, still awake. The non-coffee drinkers are probably scrolling through their news feeds confused and annoyed as to how people can be praising coffee. It’s just a drink. However, it’s not just a drink. How many times has someone asked you to go “grab a cup of coffee?” Coffee is the universal symbol of camaraderie. It has this way about it that brings people together. Whether catching up with an old friend, meeting a client or colleague, or spending the morning with a loved one in the comfort of your own home. It’s just a drink. But it’s used for so much more than just to stay awake through the work day. Now don’t get me wrong, I would not be a fully-functioning human without my morning cup of coffee, but caffeine isn’t always the only purpose for the hot (or cold) beverage. At home on college breaks when my mom and I both have the morning off, we get to use our time drinking coffee just to hang out together. Or we make specific dates to go to the local coffee shop. Yeah we spend plenty of time together without coffee in the mix, but these moments are some of my favorite times. I may be overanalyzing the idea of coffee and camaraderie. Okay, I’m DEFINITELY overanalyzing it, but I can’t help it. All my friends know I would love to open up a coffee shop one day and it’s not just because I love coffee, lattes, biscotti and breakfast. It’s because I love the coziness I feel while curled up to a warm mug. I love the amount of work I can accomplish on a busy afternoon in a coffee shop. I love watching people come and go, meeting friends for just a quick moment during their chaotic workday, all under one coffee shop roof. So to me, it’s not JUST the caffeine and taste that drives my love of coffee, although there are many days where this may be the case. And with all this, I hope everyone is having a lovely (and rainy) National Coffee Day. I love social media. I also hate social media. I’ve developed this love/hate relationship because I love what social media has the power to do for good. I’ve seen successful charity initiatives, family and friends reconnecting, celebrations, and of course there is my admiration for social media marketing. But I’ve also witnessed the negative power social media has on its users. Sometimes social media is used, for a lack of better phrase, just to be mean. And I’m not sure if the effect that typed words have on others is always understood. When I graduated high school and was ready to take on the almost real world, I was a little naïve in believing that everyone would just go on through life, doing their own thing and not caring about what the person beside them is doing. I’ve noticed this is the case in most scenarios, but then there are the instances where you read or hear certain critiques of people that are blatantly mean. Even the smallest pieces of a person’s life or body can become the subject of criticism and gossip. This always catches me off guard because we all have such different styles and personalities that you’re bound to come across people of all kinds. No, we are not going to be friends with every person we encounter, but that doesn’t mean we can’t show kindness in our interactions with other people, after a person walks away AND when we get in front of a computer screen. You don’t like someone’s hair? Cool, don’t get yourself that haircut at your next appointment. Does someone have a different political view than you? Awesome! Because you’re actually allowed to express your own opinions (AMERICA, yay). Does someone have a hobby you think is weird? GREAT, let that person enjoy it and don’t try the same hobby in your spare time. But why make a negative comment toward any of these? Does laughing at another person’s appearance actually benefit your life in any manor? Unless you’re making money off judging people’s appearance (Fashion Police, looking at you and not as a fan) then I’m guessing, probably not. Maybe instead of frowning upon something we don’t like or agree with, we start looking harder for the things we do appreciate in a person. Even a random stranger. I know it’s unheard of. Why would you EVER talk to someone you aren’t friends with? Just wait and see the smile on that person’s face when you tell them their outfit looks great, or that they did amazing on that class presentation. I like to believe I am part of the norm when I say that this actually makes me feel a hell of a lot better than ripping on a girl’s dress because it might not be something I’d pull out of my own closet. Never post something that includes the kind of humor Ellen DeGeneres would not be proud of. I’m by far not a saint over here, but I am working a little harder each day to throw a couple extra compliments around if I get the opportunity. It’s not going to solve anyone’s life problems, but at least it might give a friend (or stranger) a quick smile and some extra confidence during what might just be a pretty rough day. It’s the phrases people my age throw around left and right. What job will I have? We have such anxiety about not being prepared for our futures. However, what we are doing right now is preparing us for our futures. The classes. The majors. The internships. The summer jobs. We’re doing everything right to better ourselves for what’s next after we graduate. Yet, why do we still feel unprepared? Well to be honest, I think it’s because that’s life. Life is uncertain. Life changes. We don’t know our futures, but that doesn’t necessarily mean we have anything to worry about. Not knowing isn’t a bad thing. Not caring may be bad, but not knowing? That’s normal. The whole “I don’t know what I want to do with my life” dilemma is exactly why we have to be so open and willing to try everything and take every opportunity. To make the big decisions, the small decisions. To make a change if we aren’t positive or happy about the way something is going (cue the mid-college transfer). After all, how else will we really know what we want to do with our lives if we don’t know every option out there. We need to know what we can not should do with our lives–which truth be told is just about anything (I mean, that is what our parents and teachers have been telling us since kindergarten, right?). I may not know what I want to do with my life, but as I was reminded, I’m only twenty years old. I’m still in college and that’s what this time is for—that’s what the next 10, 20 years are for; to find out what it is that I do want to do for the rest of my life. Right now I’m trying out sports communication in my internship, but during the next few years I plan on getting a taste of multiple industries before I become a post-grad adult and begin my career in any of the possible industries. If the next decade is anything like the last two or three years, I think it’s safe to say the one thing I want to do for the rest of my life is going to change once, twice, 10 times if we’re being realistic.